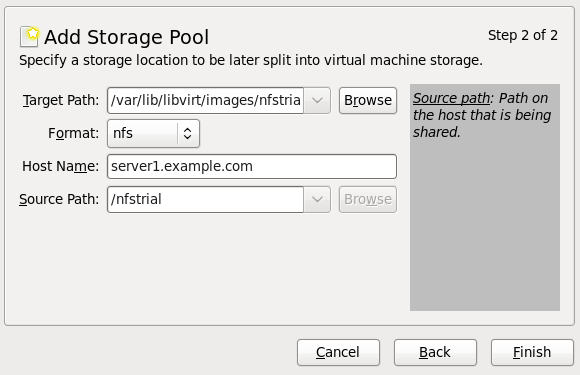 This procedure covers creating a storage pool with a NFS mount point in virt-manager. Open the Storage tab in the Host Details window. 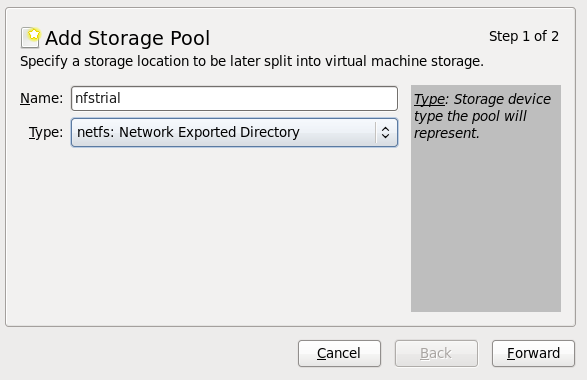 Choose a name for the storage pool and press Forward to continue. Enter the target path for the device, the host name and the NFS share path. Set the Format option to NFS or auto (to detect the type). The target path must be identical on all host physical machines for migration. Enter the host name or IP address of the NFS server. This example uses server1.example.com. Enter the NFS path. This example uses /nfstrial. Press Finish to create the new storage pool.